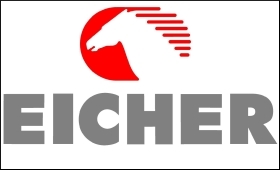 With two new 650cc motorcycles, Eicher Motors Ltd now hopes to further consolidate and grow its market share in the global mid-weight motorcycles (250cc to 750cc) segment, said a senior company official. He also said the company has started shipping the new models to Europe and offers its existing and prospective customers a good reason for upgrade. The two new models will reach nearly 870 dealer outlets in a phased manner. Launching the Interceptor INT 650 (price Rs.250,000 - Rs.270,000) and Continental GT 650 (Rs.265,000 - Rs.285,000) motorcycles here on Friday, Shaji Koshy, Head-India Business, said: "Last year the global mid-sized motorcycles market was about 14 lakh units and Eicher Motors commands about 60 per cent of that." With the two new models, the company's product portfolio has expanded and is expected to boost sales. "We are the most profitable company in this segment," Koshy claimed. He said Eicher Motors is targeting a production of about 875,000 units this year. Koshy also said that the international markets are different from India as the riding there is seasonal. According to him, the company is working towards removing the waiting period for its bikes and for the two new 650cc bikes, the waiting period is till March 2019. "The idea is to grow the market without putting the existing customers to much financial difficulty by offering the new bikes at the same estimated monthly instalments." The two bikes come with a three-year global warranty and roadside assistance service. Both the Continental GT 650 and the Interceptor INT 650 can be had in standard, custom or chrome versions with a wide range of retro options.